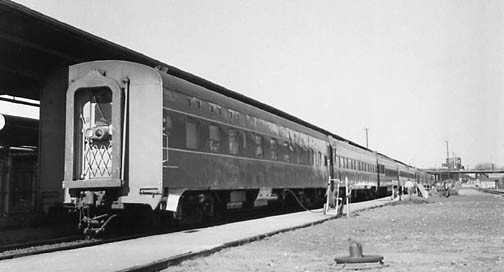 At the Los Angeles Mission Coach Yard, an afternoon crew of workers had finished cleaning the chair, Pullman cars and loading food and drink into the snack lounge car. 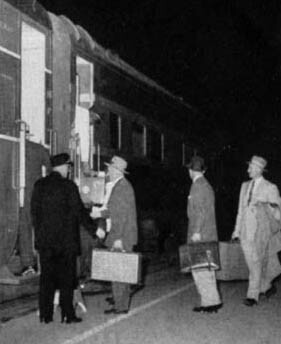 A switch engine coupled onto the cars for a short trip across the Los Angeles River into the Union Passenger Terminal for this night run of the West Coast Passenger up the San Joaquin Valley route to Sacramento. 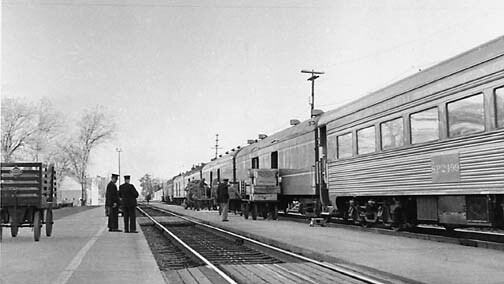 As the Station floodlights brighten the sleek sides of the passenger cars, a two unit diesel power consist backed to a coupling of the first six baggage cars heading the train. Crews are busy loading the last of the express and mail. A total of 19 men will be operating on this train tonight, six trainmen, two baggagemen, two waiters and three Pullman employees. And not to mention the agents, dispatchers and men ready to service the train along her route. At the departure time, 6:55 pm, all the station doors were closed. The station crews stood clear. Up ahead a yellow signal tells the engineer that the track was his. Gently he eased the throttle open, so gently that the Pullman passengers only saw the lights on the station platform gliding past. The chair car passengers also are settling themselves comfortably in the reclining seats. 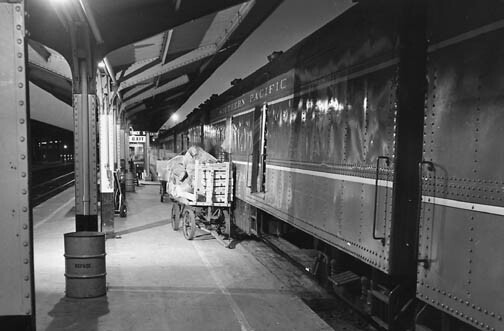 At the snack lounge car between the chair cars and Pullman, a waiter in charge is getting refreshments ready. Underneath sounds the faint clatter of wheels across the double slip switches as the West Coast eased through the stations yard throat at 15 miles an hour. Passing Mission Tower and the bridge over the Los Angeles River, #59 begins its journey northward along the river’s east bank towards Dayton Avenue Tower. Green lights on the signal bridge are for the West Coast as she runs the number one main track, skirting the edge of Taylor Yard for her first stop at Glendale. 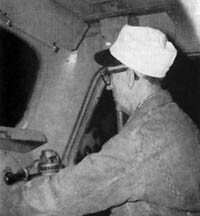 Once again gathering speed through the night, the engineer and fireman check the signal lights for safety. Up ahead at Burbank Tower where the double track ends and the single track Coast and Valley Lines begin, switches are aligned and the train orders are hung on a pick up post by the towerman. 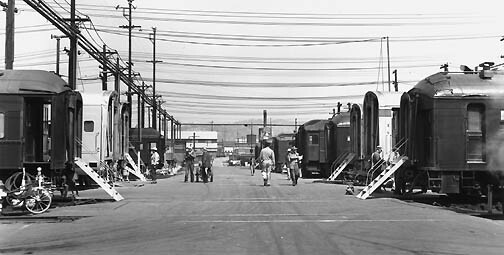 Thirty minutes pass since its departure, and the West Coast is on the Valley Line heading towards the northwestern end of the San Fernando Valley and into the 6,975 foot San Fernando Tunnel. 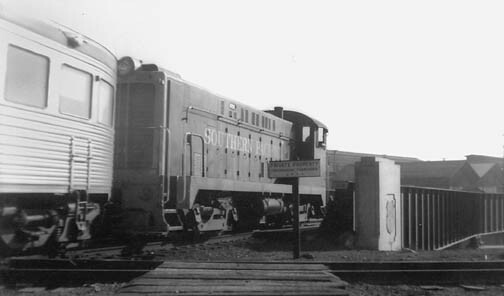 After picking up another set of trainorders at the Saugus trainorder office, her diesel headlight follows the Santa Clara River in the Soladad Canyon. Passed Palmdale, the engineer increases the throttle to 65 miles per hour across the desert towards Mojave. Back in the Pullman cars the sound is muffled. Occasionally did the wail of the diesel horns drift back through the lonely night to ears on pillows. Down the Tehachapi, as the West Coast rolls into CTC territory where the dispatcher makes time saving meets with other trains on long sidings. The train leaves Bakersfield after a crew change at 12:15 am and again in Fresno for scheduled service stop at 2:57 am. Dawn now chases the West Coast up the San Joaquin Valley towards Sacramento as the land seems to slid backwards in the early morning light.